Why Should I Upgrade to a New High-Efficiency Boiler? What makes a boiler high-efficiency? Newer condensing boilers are considered high-efficiency because they have an Annual Fuel Utilization Efficiency (AFUE) of 90% to 98.5%, compared to older boilers’ AFUE of 56% to 70%. To learn more about AFUE, see our High-efficiency Furnace or Boiler Heating Systems page. My current boiler is an oil-burner; is it true natural gas is a more economical choice? According to the U.S. Department of Energy, the average home using natural gas for heat spent at least $700 per year between 2007 and 2012, while the cost to heat a home with oil was at least $1,700 per year over the same period. How does a high-efficiency condensing boiler work? A high-efficiency condensing boiler can capture and reuse steam energy lost by older boilers. The main way it increases energy-efficiency is its ability to be run at a lower temperature. Older boilers have to keep water in the system at a high enough temperature that it does not return to the boiler at a temperature below 140 degrees Fahrenheit. Water at a lower temperature can condense, which will eventually destroy an old-style cast-iron heat exchanger. Water can condense in condensing boilers, which significantly increases their energy-efficiency. Running water at the lowest volume needed for the proper running of the system can also have a significant positive impact on energy-efficiency. What is outdoor reset and why is it important? Because a large part of a high-efficiency boiler’s efficiency lies in its ability to adjust the temperature to which it heats the system’s water based on external temperature, it is vital that the system can accurately track outdoor temperature. This requires an outdoor sensor installed in a proper location and wired to the boiler. When the temperature drops, the boiler sends hotter water through the home to offset additional heat loss due to the colder air outside. As the outdoor temperature rises, water heated to a lower temperature is sent from, and returns to, the boiler. Returning water below 130 degrees Fahrenheit is ideal for condensation, which significantly increases the boiler’s efficiency. What kind of maintenance does a high-efficiency boiler and hydronic heating system require? Check the condition of the venting system. Check physical integrity of the heat exchanger. Adjust controls on boiler to provide optimum water temperature settings for efficiency and comfort. Inspect pressure tank, which should be filled with air, to verify it is not filled with water. Drain some water from the boiler to remove sediments and improve heat exchange efficiency. Test low-water cut off safety control and high-limit safety control. Drain float chamber to remove sediments to prevent low-water cut off control from clogs. 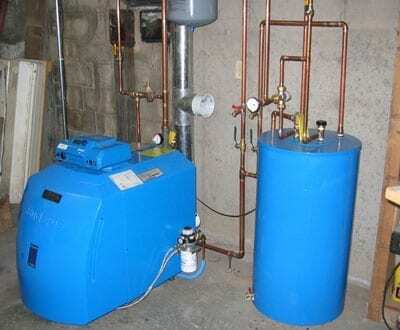 Analyze boiler water and add chemicals as needed. Perform maintenance on radiators, which will be different for one-pipe and two-pipe systems. Does Massachusetts offer rebates for upgrading the boiler powering my hydronic heating system? Yes. Click on the link to see if the planned upgrade of your heating system qualifies for a Residential High-Efficiency Heating Equipment Rebate Program.